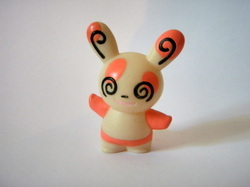 "No two Spinda are said to have identical spot patterns on their hides. 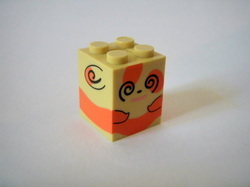 This Pokémon moves in a curious manner as if it is stumbling in dizziness. Its lurching movements can cause the opponent to become confused." 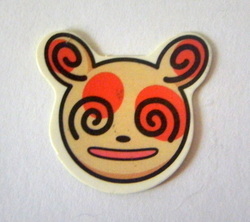 I've just realised this dot design is kind of the Spinda poster boy. 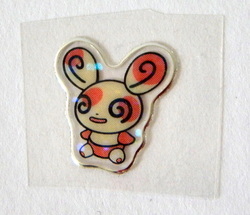 It's on every piece of Spinda merch I have so far. I always seemed to missed buying this plush. I've always said I'm not fast enough (or in the wrong timezone whatever) to collect an even slightly popular Pokemon like Spinda. BUT FINALLY, HERE IT IS. I do quite love this guy. ;u; So soft, and really nice embroidery! The smaller the plush, the more I seem to admire the design. Yujin/Takara Tomy ARTS - ? This is definitely up there as one of the coolest Zukans I own. 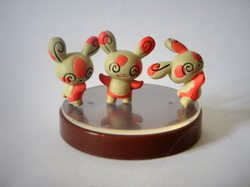 The makers gave Spinda THREE separate pieces, just to illustrate how different they all can look. This Zukan is the only one to have one MASSIVE one-peg-for-all peg. Since it seems Zukan bases will IMPLODE if they have more than two peg holes. FINALLY, SNAGGED ONE. I'm telling you, I'm too slow to collect popular cute Pokemon. I think I'd die if I ever collected an eeveelution or something. It amuses me, when you put this little pandarabbit down on a table or something, it always seems to totter a little before finding its center of gravity. This Kid was a bit of a fixer-uper..er, with a few marks and a lack of a nose. Though I think I did a fairly good job making her look as good as new. Now I know how tiny the regular mega blocks are. Like... an inch by an inch. I think. Maybe. IDK, I GREW UP WITH THE METRIC SYSTEM DAMN IT. I forever love Pokedoll stuff. SO CUTE. 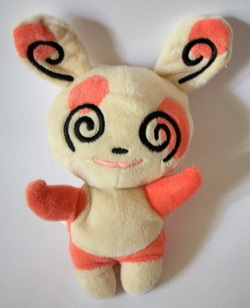 Spinda's Pokedoll art is really adorable as well, with its little nub limbs. NOW TO GET THE REAL DEAL. I now officially love Trozei stickers omg. ;u; I don't even know what goes ON in that game, but I want it JUST FOR THESE ADORABLE FACE.